'Render Stations' brings together three lines of sculptural and digital enquiry, and locates a snapshot of their development through the first half of 2017. The centrepiece of Render Stations – a set of 6 kiltered cubes – references superficial and structural modes of conduction, carrying an unused 12-bit binary encryption into its structure, while being loaded with a mix of mythical, material and dematerial surfaces, including diamonds and carbon nanotubes. 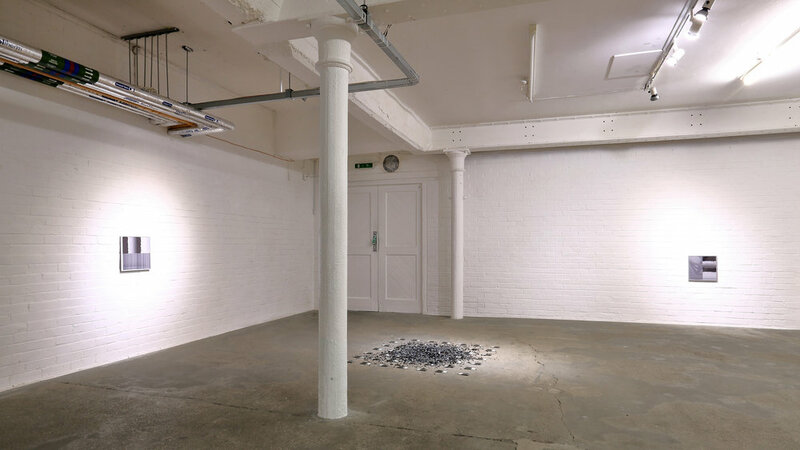 It’s joined by a floor installation of the first BlackBerry mobile cameraphones, that were joined in an encrypted network before being shredded and laid in a large grid. Completing the room is a GIF misusing the algorithm Photoshop uses to compress moving images, translating a set of identical rotated gradients into different tonal patterns. The GIF is displayed as a set of 4 Giclée prints. Broadcast tower for Sender Geibel. PF Grade I-VI timber, oil, glue with uncut white diamonds, matte spray paint, gloss spray paint, uncut black diamond supports with phosphorescent varnish, multi-wall carbon nanotubes, japanned screws, diamond dust. 49 shredded Blackberry Pearl 8110 cameraphones connected through a private network. 4-frame GIF as a set of Giclée prints.